Northwestern State University will hold its Fall 2018 Commencement Exercises Friday, Dec. 14 in Prather Coliseum. Graduates from the Gallaspy College of Education and Human Development, the Louisiana Scholars’ College and the College of Arts and Sciences with the exception of those receiving degrees in general studies will receive diplomas at 10 a.m. Graduates in general studies along with those receiving degrees from College of Nursing and Allied Health and the College of Business and Technology will receive diplomas at 3 p.m. The commencement speaker will be State Senator Gerald Long. Long is serving his third term as state senator for District 31 and is the current Senate president pro tempore. He was elected to the State Senate in 2007 and re-elected without opposition in 2011 and 2015. Senate District 31 includes all of Sabine and Red River parishes, a majority of Natchitoches Parish and parts of Grant, Winn and Rapides parishes. 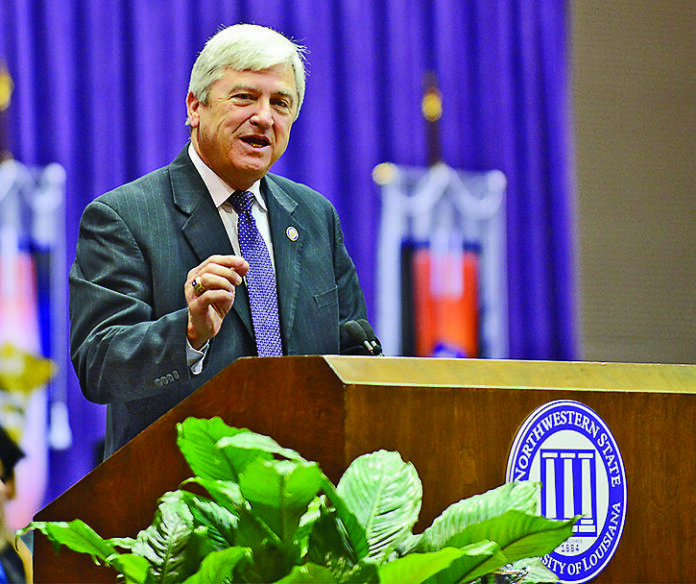 Long is a graduate of Winnfield Senior High School and Northwestern State, where he earned a bachelor’s degree in education with a concentration in social studies and a minor in English. His work experience has included teaching at Houma Junior High School, Leesville High School and a career with State Farm Insurance. After retiring from the insurance business, he became a representative for the Fellowship of Christian Athletes where he served students throughout the district. Long is married to Valerie Aymond Long and combined they have four children and 11 grandchildren. He is a member of First Baptist Church of Natchitoches, where he serves on the deacon board. Long is a member and past president of the Natchitoches Kiwanis Club, Natchitoches Chamber of Commerce, Northwestern State University Athletic Association Board of Directors, Louisiana Abraham Lincoln Bicentennial Commission, Legislative Advisor Board Southern Regional Education Board, Legislative Rural Caucus, Ark-La-Tex Investment & Development Corporation. He was elected Man of the Year by the Professional Business Women of Natchitoches in 2005, elected Legislator of the Year by Rural Hospital Association in 2008 and awarded the Tourism Louey Award in 2012. As a state legislator, Long has served as vice chairman of the Senate Committee of Insurance. He sat on the Revenue & Fiscal Affairs Committee, Education Committee and also was on the Select Committee on Homeland Security. He serves as chairman of the Natural Resources Committee and sits on the Agriculture, Forestry, Aquaculture and Rural Development Committee, Insurance Committee, Retirement Committee, serves on the Joint Legislative Committee on the Budget and is an interim member of the Finance Committee.